Which finger got banged up? And it has me wondering if I should attend tomorrows high school track meet? Perfect events for Son. He’s been flinging himself about since he could stand on two feet. 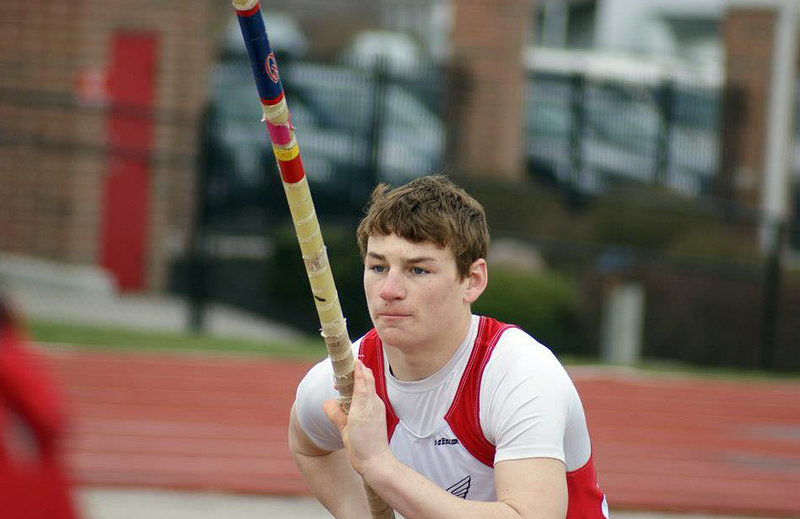 A freshmen, he never pole vaulted until last month. He gave it a try (no training, or experience) and quickly jumped 10 feet. He regularly swings up over 10 and 11 feet, using his trusty (or at least we hope it is!!) pole. Last Saturday was Cold. And windy. It was one of those track meets where only a parent will stand out there. And there I stood, out on the football field, watching Son high jump. I was wrapped up like a burrito in a giant, fleece blanket. My arms all wrapped up IN the blanket. When high jump was over, I shuffled back toward the bleachers and tripped over my blanket. My hand smashed into the ground. Hard. Sh#t! My middle finger was headed in two directions. Where it met my hand, it was going left. But the top half definitely wanted to go to the right. I trudged up to the press box, to get my daughters car keys. I had to borrow her car because mine is stick shift. I drove to our local family doctors office, waited an hour for the x-ray tech to come in. (As always, I had a book in my purse.) Then I got nerve blocks in my finger, so they could yank it back into place. The finger was also broken, and the tendons and ligaments are a tad bit banged up. 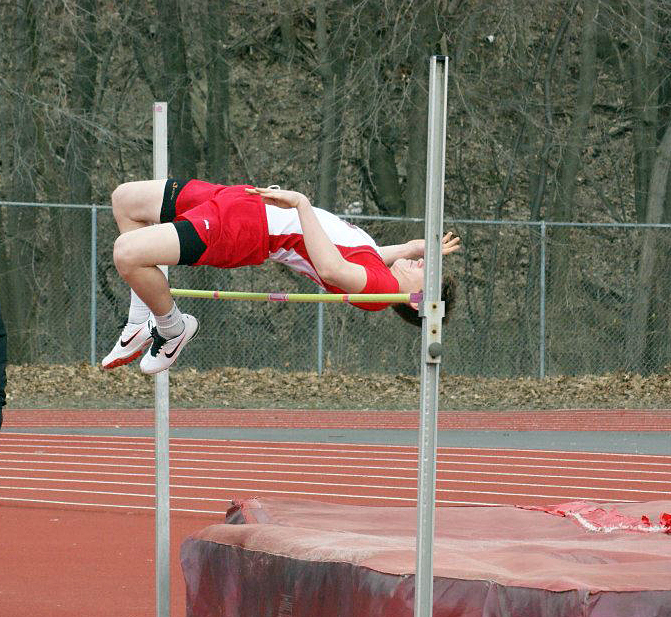 Luckily, I got back to the track meet in time to see Son pole vault. But for most of this week, my hand looked like a paw. 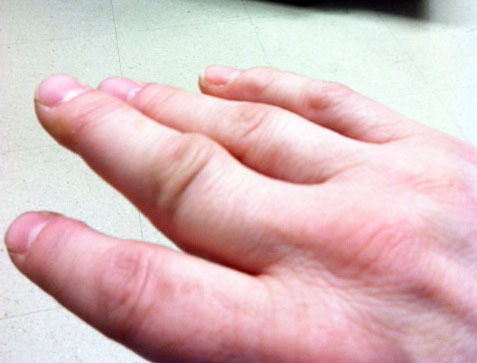 Fingers, knuckles and hand were swollen to nearly 2x the size of my other hand–and a bit purple. There are three fingers on the hand that were jammed. Probably, I won’t ever be putting rings on those fingers again–unless the knuckles return to their normal size. And yes, I type for a living with my job at The News Herald. Friend: You went down? All the way to the ground? Co-worker: THAT’S THE STORY? You’re going to have to come up with a better story. Me: One where I don’t look like an idiot?? Lastly, Daughter teased me when I couldn’t do things; grip a pen, brush my hair properly, etc. Darling Daughter: It’s a finger, you have nine more of them!! Darling Daughter: Be careful you don’t stub a toe. That might really sideline you!! I restrained myself, but I really wanted to stick my finger in the air. To help my circulation, of course. So the blood didn’t rush to my swollen hand, and make it throb. Not because I wanted to signal the kids. I’m a little apprehensive about attending the track meet. Last week, Son was 10+ feet off the ground. And I got hurt, putting one foot in front of the other?? Plus, I’ll be out in public. Which means the beating I’ve taken all week is bound to continue. And I get it. I give those around me plenty to make fun of. I know they can’t help themselves. Or as careful as I can be.